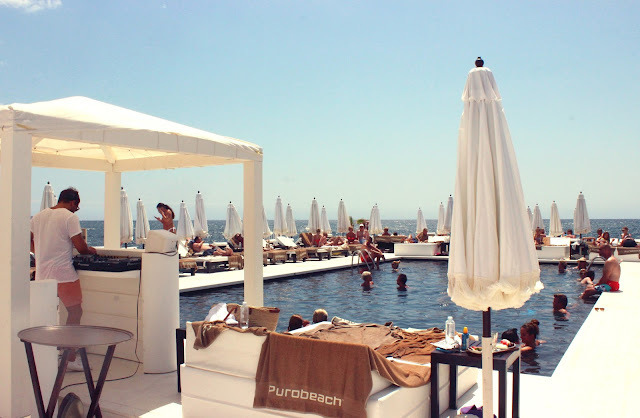 Hey everyone, today I'm gonna take you to a beautiful beach club on Mallorca, welcome to Purobeach Palma! My uncle took me to this fab place for lunch last week and even though it was pretty windy, we had a great time. The beach club's clean style and location on the water make it unique. I tried the yummy Ensalada Queso Cabra - a tasty salad with goat cheese, peach, and caramelized walnuts - and the Patatas Mexicanas. I can totally recommend the green curry too, my uncle tried it and it was delicious! Located on a peninsula close to Palma and the airport, Purobeach is a beach club/bar/restaurant with a great view that attracts many hip and classy visitors who are looking for a relaxed but chic atmosphere. Whether you'd like to take a dip in the pool, relax on the sunbeds, have a great time with your friends at one of the Puro parties, or simply have lunch with your love - Purobeach offers many different activities, plus there is also a Purobeach shop with stylish and elegant clothes and jewelry. The white sofas, the pool and deep blue sea make you want to get lost in a world of peace, luxury, summer drinks, lounge music and marvelous sunsets. So if you happen to be in Palma this summer, why not swing by? If you like stop by their website (www.purobeach.com) or find them on Facebook (purobeachpalma) and Instagram (purobeachpalma). Beautiful pictures and amazing beach club! Que preciosidad "Puro Beach " es muy parecido al " Marina Cíes Beach Club " de Vigo !!! Wunderschöne Eindrücke, da wäre ich jetzt auch lieber als in Deutschland.